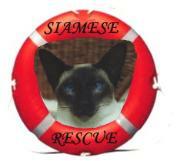 Siamese Cat Sites - listed are those who are still maintaining the "pure" breed. i.e. minimum 8 generations Siamese seal point, chocolate point, blue point or lilac point. Wollongong, New South Wales. The home of many of our babie's "dad". Anne is a terrific supporter of our cattery, so please visit her site. Reach, near Windsor,New South Wales. proud owner of Kalinya Outback Jackman - a seal point stud male. Siamese using well established traditional lines. Located in Sydney. achieving 5th Group 2 Male Cat of the Year 2008 with Astraxalotte Onesimo. transport can be delivered anywhere in Australia. Australia and overseas. Please visit her Website for testimonials. registered with QFA, and share their everyday life.